It’s difficult to find a more beautiful place than the Smoky Mountains in June. Spring’s lush green is everywhere. Colorful wildflowers blanket the hillside. The sun sets late, slipping slowly behind the mountains as lightening bugs flicker in the evening sky. The heat and humidity of later months has yet to arrive. And, best of all, the rhododendrons are in full bloom. Catawba Rhododendrons, native to the Southern Appalachians, bloom in late-May at lower elevations and in mid-June higher up. The purple-pink bloom lasts only for a short time but is beautiful. One of the best places to view them is at the Roan Mountain Gardens on the North Carolina side of the NC/TN state line. 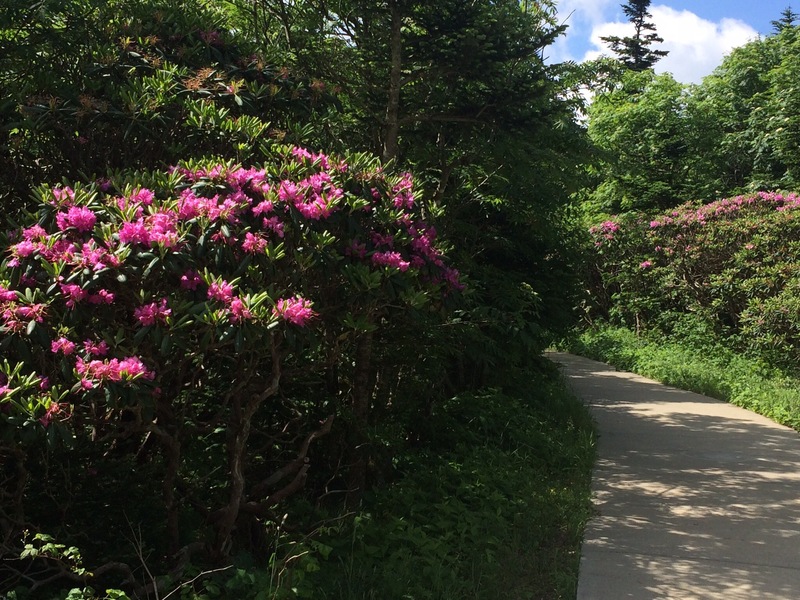 Here you can wander through a naturally occurring rhododendron garden high up at an elevation of over 6000 feet. The main path is paved so it is accessible to most people. The bushes are dense and, when in bloom, make for a magical hike. But the best part are the picnic areas. Tucked away in corners of the park are picnic areas. 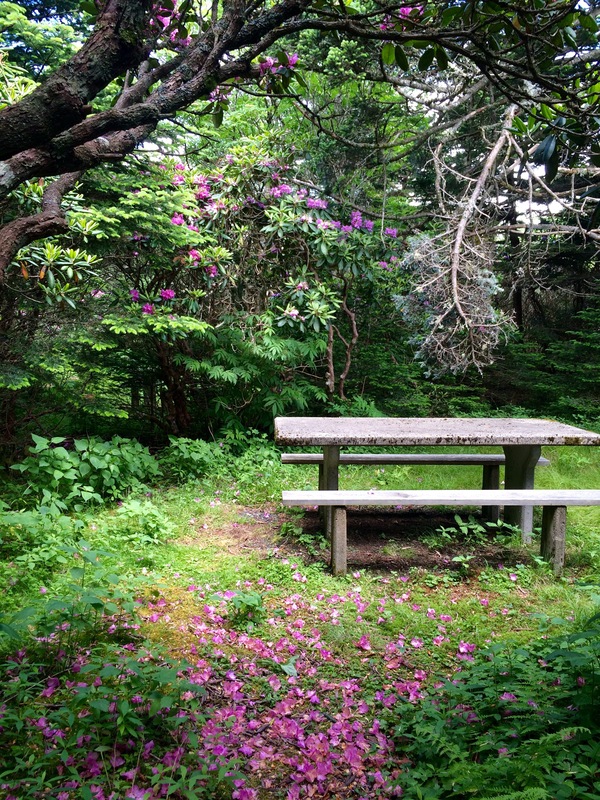 Moss covered tables nestled under pines and the rhodendrons. As the flowers fall they cover the ground creating a pink carpet. A fairytale setting for a romantic picnic! You can find more information about Roan Mountain Gardens, including its exact location, here. Most days I drive the streets of the county I live in thinking of the day’s activities, where we need to go, how late we are running. Always in a hurry, I give little thought about the surroundings I know so well. I drive the kids to school, drive around for work, take the kids to their activities, all the while passing homes and farms and buildings and stores without notice. When we go to a new location my eyes are open taking everything in; it’s all so new and exciting. “I wonder what that building was originally used for?” or “Where could that trail lead?” or “How old is that house and who might have lived there?”. But here in my own county I know have seen it all, heard it all, I know the history and events of the area. I take the kids to a park and they run around in the open field, climb around on the monkey bars, my son plays hockey with his friends, we have a snack on a picnic table without a thought to what might have been there. I guess if I would think about it, perhaps the playground was once a farmer’s field or a wealthy homeowner’s property deeded to the town. But who has the time to wonder about the history of a playground, I need to gather the kids into the car and hurry home to make dinner!